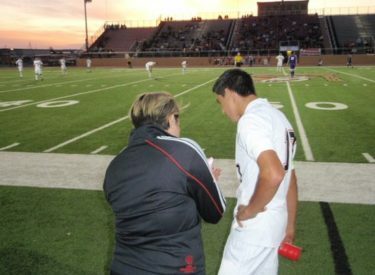 Liberal head soccer coach Lor Navarro talked with the Sportsguys Monday morning after Liberal’s 3-1 win in the state championship game Saturday in Kansas City over Blue Valley. She talked about the team’s motto "By His Grace, For His Glory." She also talked about the crowd chanting that to begin the first half. She discusses the celebration of the state championship. She talked about Liberal’s goal 10 seconds after Blue Valley made it a 2-1 game to give the Redskins the commanding 3-1 advantage. When asked whether she would return to coach next season, she responds "no comment." Click on the icon to hear the interview.